The Expanse is my favorite space opera series right now – the only space opera series that I’m still following, to be honest, when I’ve given up on so many others. Not only are things still going strong at book five, they also just keep getting better and better. 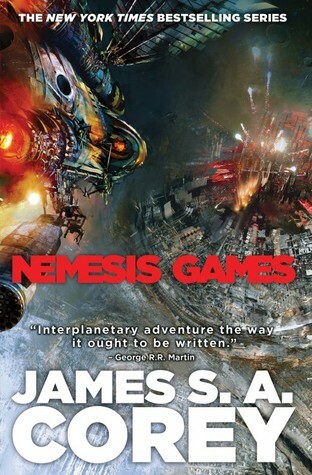 I thought Cibola Burn was going to be the best installment we’ll see for a while, but then along comes Nemesis Games, teaching me what a mistake it was to underestimate Daniel Abraham and Ty Franck, the writing team behind the pseudonym James S.A. Corey. Bottom line, this book was simply stellar. The reason why I think this series is so successful? Every book gives the reader something new. The universe of The Expanse is constantly evolving, with major consequences following in the wake of each installment. No longer are the stories simply focused around the mysterious proto-molecule introduced in Leviathan Wakes. Ever since it was released into the solar system in the third book Abaddon’s Gate, opening a literal doorway to a thousand new worlds, the potential for more interesting stories has exploded. I see Abaddon’s Gate as a turning point for this reason. And now I think Nemesis Games may be another one. The events of the last novel have not stopped the frantic land rush through the massive ring-like gates, as settlers fight tooth-and-nail to be the first to colonize new planets. This has created a drastic change in the power structure of the old solar system, where three main factions exist: Earth, Mars, and the Outer Planets Alliance. OPA was mainly formed to bring together the population born in the Asteroid Belt. Called “Belters”, they are an oppressed group, marginalized and frequently discriminated for their distinct culture and language, as well as for looking physically different from the humans from Earth and Mars. But recently, Belters have started to resist the powers of the inner planets, and one extremist group has gone as far as to target Earth in catastrophic attack, killing millions upon millions. In the middle of this mess, the crew of the Rocinante are separated. The decision to go on shore leave right after surviving the events of Cibola Burn meant that Holden, Naomi, Amos and Alex were all in different places when the attack on Earth occurred, so for the first time in this series the four of them aren’t together for the majority of the novel. Before you get too disappointed though, this turn of events also means that for the first time ever, we get perspective chapters for every member of the crew. I can’t tell you how excited this made me. I’ve been waiting a long, long time to see the points-of-view for the others besides Holden – especially for Naomi, the only female and the only Belter of the Rocinante crew. It’s hard to believe that it took so long, but after four books, we’re finally getting the chance to get up close and personal to characters we’ve been following since the beginning. But that’s not all, either. The authors continue to sweeten the deal, bringing back some perspective characters we’ve seen in previous books, familiar names that include Bobbie Draper, Clarissa Mao, and – wait for it – Chrisjen Avasarala! (Best. Character. Ever.) While none of them return as POV characters, all three women have significant roles to play in Nemesis Games. I’ve also said before that the books of The Expanse tell very human stories. This one is no exception. Separated in the wake of the Earth attack and in the midst of all the death and suffering, the four members of the crew realize how much they mean to each other. It’s very touching as each character struggles to find their way back together, realizing that the spaceship Rocinante has become a home for their little family. During their individual fights for survival, we gain a lot of insight into each person’s past. Naomi’s backstory is perhaps the most surprising of all, and also the most heartbreaking. Every book in this series so far has had four character perspectives each, and one always seems to stand out for me above the rest. No question about it, in Nemesis Games it was definitely Naomi’s. As much as I enjoyed Amos and Alex’s POVs as well, I just couldn’t get enough of Naomi’s chapters, which really brought her courage and resourcefulness to the forefront. The book ends with a promise of much more to come, including possible new additions to the Rocinante family, which would be very interesting to see. It doesn’t quite leave us with a cliffhanger, though we do get the sense of unfinished business, so you can bet I’m on board for book number six. All told, The Expanse shows no sign of slowing down, a great sign for a series that is planned to include a total of nine books, and I’m grateful that thus far we’ve been seeing a very reliable release schedule of one installment per year. With the TV adaptation coming to Syfy, now there’s yet another reason to get excited. Nemesis Games is the last novel to come out before the series airs, so what are you waiting for? Get on it! Oh I’m glad to see you had such a great time with this book. I’m not sure it’s for me as it’s maybe what I don’t really like in Sci-fi but thanks for the review. Great review and… let’s start the countdown for Leviathan Wakes on screen! I was loving the first one, then 80% in I just read one too many vomit zombies, set it down to revisit later, and now YEARS have passed! One of these days I’ll give it another chance. I do have the first book to try! In fact I think I probably mentioned that last time you reviewed one of these books and I was really hoping to get to it for the science events I took part in. I really want to read this. Space Opera!!!! Yeah, I hope so too. I bought this and also Lock-in for the last event but didn’t get to them. I read the Ann Leckie book instead and tbh I really struggled with it and it just plain slowed my reading down. I’m in a minority with that book but I just didn’t get on with it at all. Hopefully the Corey books will be a massive hit! I am also a huge fan of this series. I am really hoping they are going to crush it with the tv series starting in December on SyFy going over the events of the first book! I think it’s awesome how they have stuck to their schedule if releasing one book a year for 5 consecutive years! I hope they make it 9!! Finished this last night, so now I have to put together my own review. I think Abaddon’s Gate remains my favorite of the series; I’m hoping for more about the scary aliens lurking out there waiting to devour us. This one was really good though. Corey puts together one of the best Solar Systems I’ve read, in terms of actual politics and whatnot. Too bad about Ancillary Justice, though Lisa’s opinion didn’t surprise me.